English Speaking in Ludhiana - Check out the current trend! 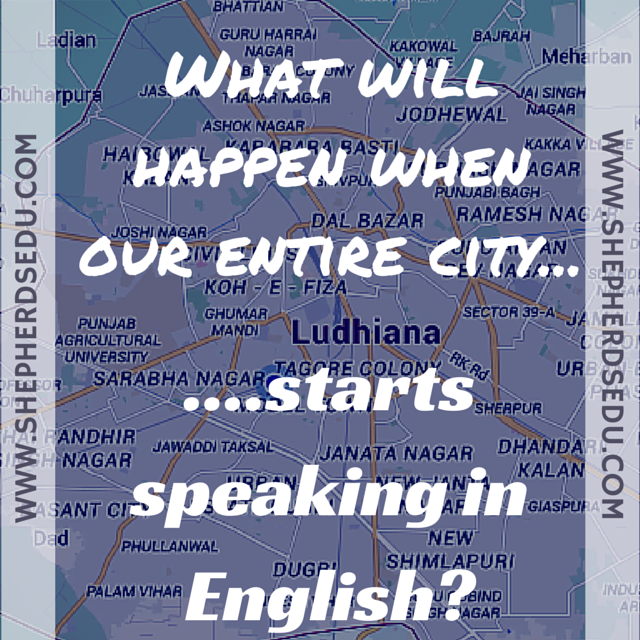 English Speaking in Ludhiana – What will happen if the entire city starts Speaking in one Language? We live in a country where after every 20-30 kilometers, the dialect and/or language depict some change. As a result of which, INDIA becomes a land of diverse languages and is known for its unity in diversity. Still there was a national language coined so that a common aspect could be developed amongst all. Normally people all over INDIA can understand Hindi up-to some extent. But, here we are discussing about the most widely spoken language all over the world and that is English. English is our renowned foreign language and is also widely accepted all over the world with not much hassles. So this is also most frequently spoken and understood language all over INDIA. But here we are talking about the effects or situations that would arise if a whole city lets say, Ludhiana, starts speaking in English. Ludhiana is a well-known business hub all over India and Asia. It is a blend of business and service class people that may or may not be highly qualified or well expose to a language that is not native to them. So their acceptance to or learning a foreign language as in English may differ but the trend of English speaking in Ludhiana is becoming popular amongst the Ludhianvis. They mostly tend to enhance their speaking and communication skills in the language by joining some good institute for English Language Classes. So in the following paragraphs we shall be discussing the effect of the language on various aspects of the city’s present scenario. Now the first and foremost thing that comes in our mind while talking about a place is its culture. This is something that defines a place’s outlook and lifestyle of people living there. As we mentioned earlier, Ludhiana has a justified mixture or blend of business as well as service class people so it is a blend of a community that can or cannot converse in English. But, if it is a compulsion or even for fun, we can say if all people can start the trend of English speaking in Ludhiana , then the scenario will be all together at a different level. Firstly, there will develop a mono language trend that will eliminate the difference between a literate and an illiterate as this is a ground to judge someone’s literacy. Secondly, people will not feel the hesitation to speak English Language as they feel presently and will develop a comfortable pace with the same. Thirdly, there will be marked or few personality development traits when all will develop a habit of speaking in English as this may boost up their self-confidence. Moving further, next comes the work culture of a place. as Ludhiana is a business hub there are many big industries flourishing over the years and few that are booming. They deal with imports and exports of machinery goods, textiles, hosiery , cycle parts and what not. It is clear that these industries have to deal with people of various countries speaking different languages. So if they have a habit of speaking English they will face no problems in their professional field. Businesses can be expanded on international levels and can be dealt with a great perfection if one can converse in English well. In the local arena having a mono language factor can also help to develop great business skills. Shifting from the business sector to the service sector we see that people who are well with English have a slight edge over the ones that cannot deal with it equally. So this narrows the spectrum for such people despite of being more qualified and deserving. So if an entire city starts speaking the same language this factor of recruitment will abolish and well deserving people will get a chance to come forward. Furthermore, there will be a better opportunity for all the professionals to expand on an international scale and fetch a better future for themselves. Now talking about the leisure aspects of the city that comprise of restaurants and others recreational activities in the city. These all will boom up if they acquire an efficiency in this language and inculcate it in their work culture. Moreover, people from outside the city or state or a country all together will be highly impressed thus increasing the popularity of a city thus making it famous all over. People on the other hand are the heart and soul of a city . Ludhiana is known for people full of life, enjoying themselves to the core and people with high grade sophistication as well. So a mono language trend will add a icing on the cake and making Ludhiana even more popular than it already is. People here have a unique lifestyle that is unmatched .along with business sense they also possess an indistinguishable sense of fashion that is admired by people all over the world. So enhancing the skill can increase their dominance in this area as well. All these were some interesting aspects that could be seen if a mono language trend develops in Ludhiana.